Why I like this book: Judith M. Glasser and Kathleen Nadeau have written this book for children using language they easily understand. But, it is an excellent book for parents to read with their children. It can also be used as a guide by school counselors who work with kids. 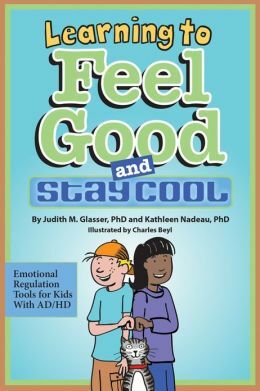 It is an upbeat book with a lot of practical information and tools that kids with ADHD can use to understand their feelings, learn tools to manage and regulate their emotions and behavior, and become more emotionally independent. The authors suggest that parents read the book one chapter at a time with their child to give them the opportunity to integrate ideas and put them into daily practice. Although the book targets children, I think it would be helpful for older kids (tweens) who can read it on their own. I especially enjoyed Charles Bey’s entertaining cartoons added humor to the book. Resources: The book is a stand-alone resource. And there are individual front pages from the author for parents and children, as well as back pages filled with resources for parents and counselors.